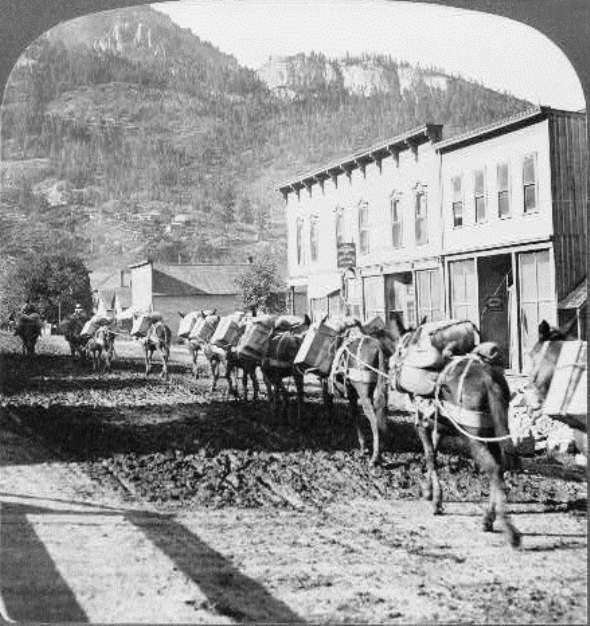 A pack train leaves Ouray with supplies for the mines in a 1905 stereograph photo by the H.C. White Co.
A band of the Ute or Nuchu tribe used the Ouray area for centuries as a summer camp and hunting ground and bathed in the hot springs. The nomadic Nuchu, hunter-gatherers who roamed the Western Slope starting around 1000 A.D., would head to valleys at lower elevations with milder weather for the winter. Fortune hunters arrived in the San Juan Mountains in about 1860 in search of gold and silver, and Ute Chief Ouray, citing an 1868 treaty that retained most of the Western Slope as tribal lands, asked the federal government to send in the Army to remove the trespassers. The Army did not intervene, and the prospectors kept coming. In 1874, Chief Ouray reluctantly signed the Brunot treaty that gave up the San Juans to settlers. The town of Ouray was established along the Uncompahgre River on the northeastern edge of the San Juans in 1875 after prospectors had staked claims to silver veins in the area. The community was named after the chief and was incorporated in 1876. The early claims included the Fisherman and Trout lodes in today’s Box Canyon Park. Ouray became a shipping and supply center for the mines in the mountains to the south and southwest of town, thanks to a roll road built into Ouray from Montrose in 1877. The area’s mineral wealth is reflected in the $160,000 sale price for the Wheel of Fortune Mine southwest of Ouray in 1877 as demand for silver increased nationally. Ouray County was created in 1877, with Ouray as county seat. In 1880, the U.S. Census found 2,669 people living in Ouray County. The Ouray Branch of the Denver & Rio Grande Railroad was completed in 1887, sharply cutting the costs of shipping ore to smelters in Durango, Pueblo, and Colorado Springs and bringing bricks and other materials that spurred a construction boom on Main Street, including the completion of the Beaumont Hotel and St. Joseph’s Miners’ Hospital in 1887 and the Wright Opera House and Ouray County Courthouse in 1888. Major producers in the 1880s included the Revenue-Virginius Mine, which shipped $27 million worth of gold and silver between its founding in 1876 and its closure in the late 1940s. The mine was southwest of Ouray, and a ghost town remains there. The richest of the silver mines was the Bachelor north of Ouray, where the principal body of ore was not discovered until 1892. By 1903, the Bachelor had produced ore worth $2 million, topping any other mine in the Uncompahgre district, which began just south of Ouray and extended north of the town, the U.S. Geological Survey reported. The silver crash of 1893, however, hit the area’s silver mines hard, as it did throughout Colorado, and most of them were closed. However, the impact on the Ouray area was cushioned by the gold mines that were emerging here. One of them was the American Nettie Mine north of Ouray, where a rich vein of gold ore was discovered in 1889, spurring the development of the American Nettie and other gold mines. Gold mining in the area got a major boost in 1896, when Tom Walsh established the Camp Bird Mine, which became the area’s largest and most famous mine and the second-largest gold mine in Colorado. Two of the original claims, the Una and the Gertrude, had been worked for lead, copper, and zinc, but Walsh and a partner examined them further and found a rich vein of gold. The mine produced about 1.5 million troy ounces of gold and four million troy ounces of silver from 1896 until its closure in 1990. The value of mine production in Ouray County, nearly all of it in gold, silver, copper and lead, topped $1 million for the first time in 1885 and $3 million for the first time in 1890, fell back to $1 million in 1894, and bounced back above $3 million again in 1899, according to data from the U.S. Bureau of Mines. Mining in the Ouray area declined during World War I, but the town rebounded with tourism starting after World War II because of its historic buildings, hot springs, waterfalls, and scenic location. The Ouray Historic District, with its buildings from the mining boomtown of 1875-1915, was added to the National Register of Historic Places in 1983. The buildings range from early log homes to simple folk and Victorian-style homes to Victorian mansions to commercial buildings that are mostly Italinate in style.